Postman Pat ran over his cat. Sadly yet inevitably, this tune is the best part of the game – and the sole purpose of the machine code. It soon descends into the usual unplayable tosh with a spurious back-story – just the sort of thing we like here at Sqij Towers! Yes, it’s the year 2000 – imagine that! 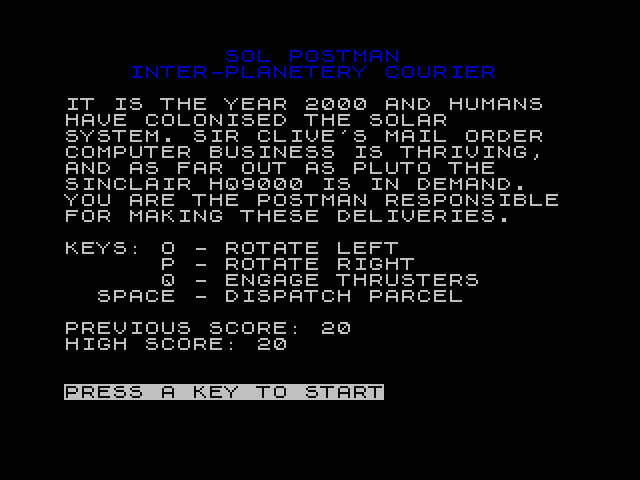 Sir Clive is running an inter-planetary mail order business, and you have to deliver his Sinclair HQ9000s all the way up and down the galaxy, from Peterborough to Pluto. In other words, it’s a sort of Asteroids clone with a spurious back story. Excellent! Yes, that funny squiggle is your intergalactic bright red van. Press space to drop the parcel, and nothing happens. 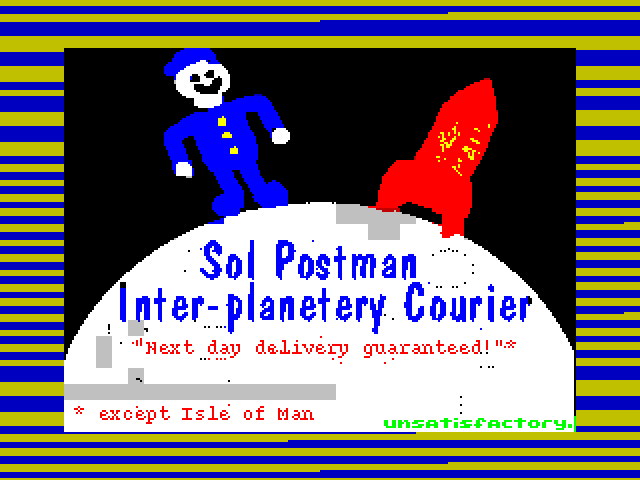 Whack the keyboard 58 times and your parcel might just be ejected, depending on what mood your Speccy is in at the time. 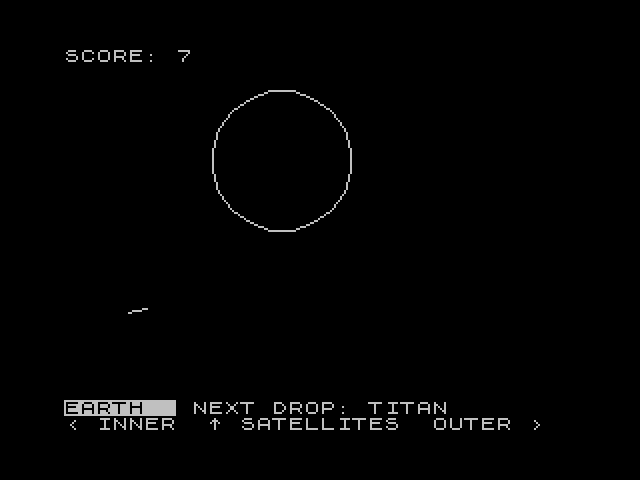 Good luck getting it to land on a planet though – I tried for a full five minutes and got nowhere, except for – and the Finbarr Saunderses among you will love this joke – crashing repeatedly into Uranus. Aha. Ahahahahaha. Waaaaahahahaha. Waaaaaaaahahahahahahaha. Wahahahyyyyyyyy? WHYYYYYYYYY?!?!??! Score: 312,597 undelivered parcels a week. *No moggies were harmed in the singing of this song. 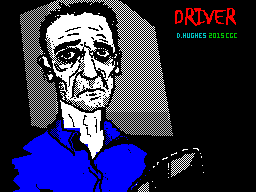 David “Dave” Hughes sent us this little gem, a tribute to Rally Driver, a game which garnered a helpful review of “A HORRIBLE NIGHTMARE”. With praise like that for the inspiration behind this piece, we wonder how Dave will manage to top that. It starts off normal enough, with usual options offering to “refine” my keys, choose my colour or – somewhat optimistically – “let the fun begin”. Where’s the nearest key refinery? After that mistake, I let the fun begin again and went a little lighter on the keystrokes. 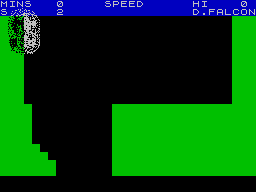 It was still virtually impossible, as it turns out that even tickling the Speccy’s keyboard with a feather is enough to shoot the car over to the other side of the screen. Added to that the accelerate/brake keys do no such thing – they just shoot your car up/down instead of left/right. I’m not sure the gear button is even connected to anything, if it is it just makes the screen scroll marginally faster and as such should be avoided. This is as far as I got. It’s about one full screen below the starting point. 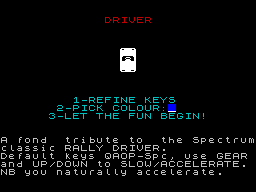 In the interests of academic research, at this point I decided to load up the original Rally Driver. I was expecting (not having read the review I quoted earlier) a run-of-the-mill scrolling car game. 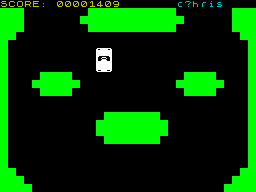 What I got was a scrolling car game with tetchy controls, crossed with Downhill Racer, and up/down inverted. Totally unplayable. I’m not sure if Dave has managed to make it any worse, but it’s certainly no better. The new “Flappy Bird”. Score: 3 seconds out of the assumed 40 hours of gameplay. 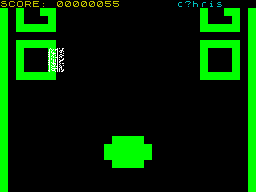 Garry “GReW” Wishart is back with his second entry for the ZX81. Now I didn’t get my Speccy until late 1985, so much like the music of the Grateful Dead, the ZX81 isn’t something I’m familiar with at all; I’ve heard of it, but I don’t necessarily want anything to do with it. However he does say to type the familiar LOAD “” command to run the game. This I try (having fired up EightyOne). I assumed the LOAD keyword would be on the letter J like the Speccy, but imagine my surprise when I get the RANDOMISE keyword – spelt rather curiously with the British “S” instead of the Americanized “Z” of the Speccy – instead! 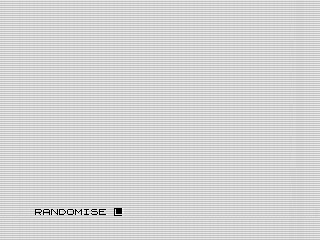 I jab away at some more keys, searching for the LOAD command, before realising I’ve actually selected a ZX80 in the emulator, not a ZX81, and I have to start the whole process again! Thankfully the ZX81 has a far more sensible (Speccy-like) layout and I find the LOAD key and start the tape. Garry’s sage advice is to turn on tape acceleration “unless you have an episode of Cash In The Attic to watch while it loads”. I’m curious to know what a ZX81 loading sounds like, but after a full five minutes of high-pitched whining (at least half of which is coming from the emulated ZX81 rather than assorted family members who have gathered in the Sqij Towers dining room to see what I’m up to) I give up and hit the flash load button in the emulator. 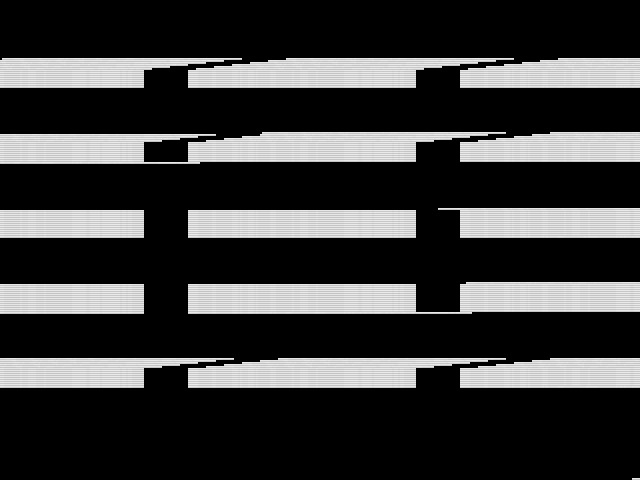 A ZX81 loading. Wot no stripy border? 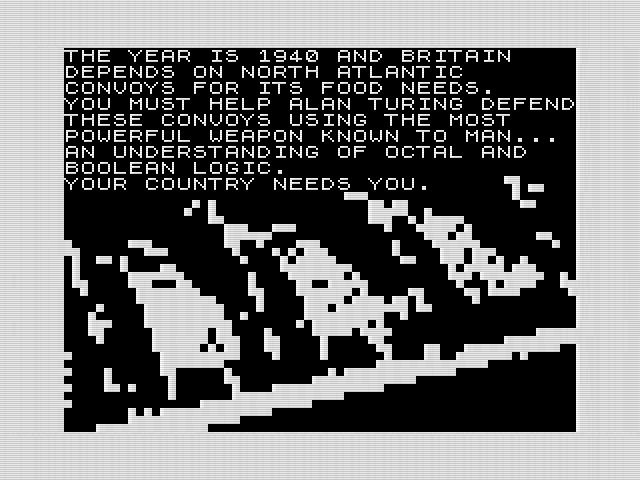 To the game – which has surprisingly detailed graphics for a ZX81, even down to the digitised piccy of Alan Turing on the title screen. The year is 1940, the world is at war, and Alan has to defend Blighty using the most powerful weapon known to man… an understanding of octal and boolean logic. Now to me, Octal and Boolean Logic sound like a grime rapper from East London and a 1970s space disco band, but it turns out Octal is a counting system a bit like decimal but with only eight numbers (curiously, not including the number eight), and Boolean Logic is a space disco band who had a hit in 1978 with “Boolie Oolie Oolie (Turn Me On, Turn Me Off, Turn Me On Again)”. Or something. The first problem appears on the screen, and immediately I’m faced with a second problem – I don’t have a chuffing clue what the answer is, even in decimal. At least with Geff Capes’ Hexadecimal Budgerigar Extravaganza (or whatever it was called) I could have a decent stab at the answer, but 023 minus 365? With the help of good old Microsoft Calculator I work out that 023 is 19 and 365 is 245, meaning the answer is minus 226 in decimal, or, erm, 1777777777777777777436 in octal. I think my calculator’s broken. Curses! So I just sort of stab at some buttons and one of my ships gets sunk. Rats! 316 XOR 214? I know that XOR means eXclusive Or, but how to apply it to octal is anyone’s guess. So again I just stab randomly at some numbers and hope for the best. I notice that quite a few of the number keys don’t work either – I think this is a feature rather than a bug, as Garry states “the routine is very poorly written and has a 1 in 256 chance of overwriting the BASIC system variables and crashing the computer.” A crashed computer at this point sounded like a far more appealing prospect than playing the game, and I must admit I didn’t progress any further – but if anyone knows what happens if and when you win, send the screenshot on a postcard to Rt. Hon. Reverend Chris Young (Mrs), Acting Assistant Under-Secretary to the Temporary Chairman, Sqij Towers, 666 Boulevard des Jeux de Merde, Biggleswade-on-Sea, Kidderminstercestershire. 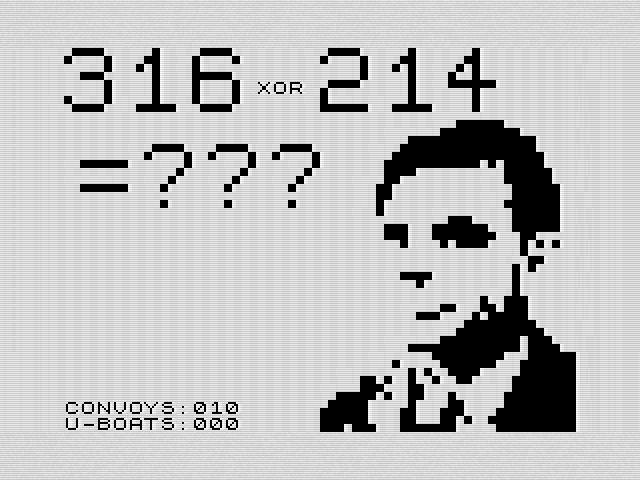 Score: 1 XOR 1 out of 144. We apologise for the break in your scheduled website. Whilst we are digging Lee out of the avalanche of crap games, here’s the theme from Lemmings as you’ve never heard it before.